Live easy without any breaks.<br/>Now with a healthy prostate. Regulate your cholesterol levels to live better longer. Unleash the man within- Strong, Fertile & 100 % virile. Relieve joint pain NOW! Lead an active life with Joint Support. Stay away from heart attacks and diabetes. Combat an unhealthy lifestyle naturally! 20/20? Why Not! Supplement your vision with eye vitamins and mineral supplements. Nurture from Nature with vital trace chemicals called micronutrients. These play a vital role in keeping our mind, our body - healthy, fit and young! . To protect your Entire Family! Our immune system is comprised of highly specialized white blood cells. The natural killer cells are a major component of the body’s first line of defense that engulf and destroy foreign invaders. 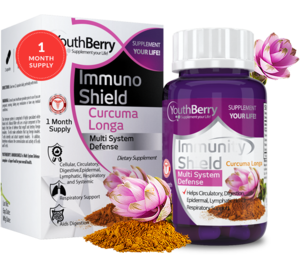 YouthBerry’s ImmunoShield is Multi System Defense complex - a Super Food for your overall health. Try them now to protect and support your overall health. Hop on over to our blog to find fun and useful tips, tricks and strategies that will help you make healthier decisions every single day! Take a step forward for a healthier tomorrow. And we will do the rest! Start by choosing one of our 97 products, today!